‘Jewish art does not exist,’ writes Margaret Olin, not inflammatorily but factually, referring to the Second Commandment that prohibits both the creation and idolizing of graven images. This prohibition is just one of at least 613 Halakha, the laws that guide Jewish life, both spiritual and practical, from kosher cooking to image-making. The artists selected in ‘The New Authentics: Artists of the Post-Jewish Generation’ are not burdened by religious laws; rather, as with Reform Judaism, tradition means culture. In this, the works transmit not sacred commandments but an equally centuries-old Jewish attitude: self-deprecation, a funny sort of pride. Lilah Freedland’s photograph of a hitchhiking Jewish woman (her sign reads ‘Israel or Bust’) sports a forbidden tattoo. 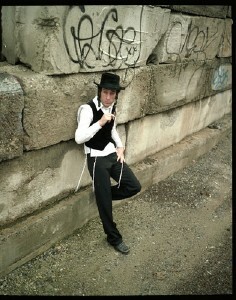 In another photo, a Hasidic teenager nonchalantly smokes a cigarette, James Dean-style. And then there is Freedland’s drawing of a Hasidic man using a video camera while wearing prayer implements. The implicit humour and transgression almost don’t even register here, as the self-mocking gesture is so widespread as to go unnoticed. At the centre of the show is David Altmejd’s wondrously shape-shifting wolf-man pierced by mirrored stalagmites. The figure gently tugs at his testicles, which perhaps ignited the violent transformation from gnatty-haired beast to sandal-wearing man. Could this be an allegory of circumcision, man’s visceral initiation into the religion? Or is the wolf-man simply a convenient symbol for all things religiously enchanting, from creationism to the Golem to Kabbalistic mysticism? Altmejd’s magical wolf-man offers some respite from Karl Haendel’s burdensome subjects. Democrats, Republicans, newspaper headlines, fighter jets and an exercise machine reminiscent of a noose are all pristinely drawn, their irony stated matter-of-factly. Similarly, Collier Schorr’s photographs of contemporary German teens wearing Nazi uniforms naughtily push a boundary, yet the clothes fit so handsomely, almost naturally. Self-deprecation gives way to self-effacement, provoking the Second Commandment, as if the annihilated Jew were himself a graven image wrecked by iconoclasts. The constantly transforming Jewish identity is certainly the topic at hand, from Schorr’s propped neo-Nazi youth, to Shoshanna Weinberger’s Zulu Jew drawings, to Jennifer Zackin’s Tibetan-infused video collage. Zackin also collaborated with Sanford Biggers to recreate a middle-class, wood-paneled living room showing film reels of a white family’s Hanukah party and a black family’s Christmas dinner, and respective trips to Disneyland. While no sound is played, the painfully sappy ‘It’s A Small World’ creeps into the mind, perhaps just a few steps removed from comedian Sarah Silverman joking that both ‘elderly Jewish people’ and ‘young black men’ share a love for white shoes and track suits. Mindy Rose Schwartz’s sculpture perfectly balances the humility of contemporary Jewishness with an earnest interest in personal history. Like a makeshift memorial, the piece rises upward from white stones, the type that is generally placed on grave markers. Atop it stands silver metal flowers and ceramic tchotchkes, all tied together with macramé. What any Jewish grandchild will recognize here is not the scriptures or strictures but the everyday magic of a trip to grandma’s house.